Do I qualify for Social Security Income? Do I qualify for social security benefits ? Can My Family Get Benefits from Social Security? Is Alcohol Abuse A Disability? and Nelson M. Gantz in Noble: Textbook of Primary Care Medicine, 3rd ed., Copyright © 2001 Mosby, Inc.
• Associated features, that is, irritable bowel syndrome and headaches . Fatigue is the hallmark of the chronic fatigue syndrome (CFS); fatigue must be new, persistent, or relapsing and associated with a 50% reduction in a patient’s premorbid activity for at least 6 months. In the mid-1980s, reports erroneously linked CFS to Epstein-Barr virus (EBV), and CFS continues to be controversial. Fibromyalgia is a similar disorder of widespread musculoskeletal pain and fatigue with other symptoms, such as poor sleep. CFS and fibromyalgia are overlapping disorders; about 75% of patients with CFS also meet the criteria for fibromyalgia, and vice versa. The onset of CFS is often acute after an infectious illness, typically viral, whereas the onset is often gradual with fibromyalgia. The cause of CFS and fibromyalgia is unknown. Patients with fibromyalgia report either a gradual onset of their disorder or an “event,” such as a flulike illness or physical trauma. Patients with CFS often recall the onset after an acute viral illness. In 1990 the American College of Rheumatology outlined guidelines for diagnosing fibromyalgia by requiring that widespread pain be present for 3 months or more. Widespread pain refers to pain involving both sides of the body and above and below the waist. In addition, to fulfill the diagnostic criteria, pain must be present in 11 or more of 18 specified tender points on digital palpation (see fig,1 ). Other symptoms and signs include sleep problems, fatigue, stiffness, and cold intolerance.  Is not substantially alleviated by rest, and Results in substantial reduction in previous levels of activities.  Is not relieved by rest, and results in a substantial reduction in previous levels of activity. The diagnosis of CFS is difficult and remains one of exclusion. No laboratory test can confirm the diagnosis; routine laboratory tests are normal, and the erythrocyte sedimentation rate is not elevated. Similarly, antinuclear antibody or rheumatoid factor testing should be ordered only if the patient has joint complaints. Selected immunologic tests may be abnormal in patients with CFS but are indicated only for research purposes. Although symptoms of the so-called yeast connection or Candida hypersensitivity syndrome overlap those of CFS, no evidence indicates that the “yeast syndrome” exists, and testing for Candida antibodies is not indicated. Cortisol excretion is decreased in CFS patients compared with controls. This may result from a deficiency of corticotropin-releasing hormone (CRH) or another stimulus of the pituitary-adrenal axis. In contrast to patients with CFS, cortisol secretion may be increased in patients with primary depression. CFS has been associated with neurally mediated low blood pressure .In one study 30% to 89% of patients with CFS dropped their blood pressure when placed on a a tilt table and responded to salt loading, fludrocortisone, beta-adrenergic blockers, and disopyramide. Magnetic resonance imaging (MRI) brain scans may show multiple foci of high signal intensity in the white matter in patients with CFS compared with controls. The meaning of these findings is unknown, and an MRI brain scan is not useful as a diagnostic test. Patients complain of multiple cognitive defects, but various neuropsychologic tests have not been of value in documenting these abnormalities. Although fatigue is a hallmark of CFS, no myopathy has been identified. Similarly, patients often complain of weakness but on testing demonstrate normal muscle strength. Widespread pain and multiple tender points are characteristic of fibromyalgia, but again, no diagnostic laboratory test exists. Patients with fibromyalgia sleep poorly, and sleep abnormalities have been identified on electroencephalograms; however, these findings are not specific for fibromyalgia. Many patients with FM complain of cognitive difficulties. A recent study has shown poorer working memory, word groping, and poorer vocabulary in FMS as compared with age matched controls. While no appropriate studies have been published, these symptoms may be contributed by poor sleep, fatigue, psychologic factors, and medications among clinic patients. Originally observed by Yunus , it is now well accepted that there are many similar conditions that overlap with FMS. The expanding list of these conditions, which occur more frequently in FMS than control groups, include irritable bowel syndrome (IBS), tension-type headaches, migraine, temporomandibular dysfunction (TMD), myofascial pain syndrome, chronic fatigue syndrome, restless legs syndrome (RLS), multiple chemical sensitivity, and post-traumatic stress disorder (PTSD), among others. One third of FMS patients have ( restless legs syndrome ) RLS . RLS is characterized by an unpleasant sensation in the legs, feet, or sometimes in the thigh, often described as “insects crawling,” “worms writhing,” or tingling or numbness. The fundamental characteristic of RLS is that it occurs at rest (while in bed, prolonged sitting) and relieved by movement, unlike the paresthesia of peripheral neuritis, which does not have this definite pattern. immunoglobulins) have no role. Some patients have hypotension on tilt table testing and may benefit from salt loading, fludrocortisone, or beta-adrenergic blockers. Since no specific therapy exists for CFS and fibromyalgia, emotional support is critical. Patients should be followed to continue to exclude other medical problems. In more than half of patients, symptoms persist for years. 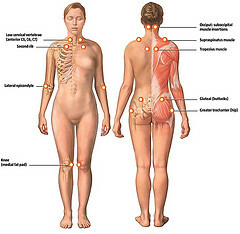 Although most patients with FMS describe an insidious onset of their symptoms, sometimes dating back in childhood, a significant minority (25–30%) state that their fibromyalgia was triggered by a certain event, for example, trauma, infection (mostly viral), surgery, another medical illness , or mental stress . Most patients report that their symptoms are aggravated by cold and humid weather, winter months, poor sleep, repetitive or other forms of physical injury, mental stress, and physical inactivity, and are improved by warm and dry weather, warm months, rest, moderate physical activity, good sleep, rest, and relaxation. As is the case with history taking, physical examination of a patient suspected to have FMS from symptoms should be “fibromyalgia focused” that is, examination for tender point elicitation with additional examination for concomitant or associated conditions If postural hypotension is suggested by history, blood pressure should be taken in recumbent and standing position, followed by a tilt table test , if necessary. A drop in systolic blood pressure of >25 mm Hg, a failure to increase heart rate, or development of syncope may be taken to be a positive tilt test . .
• Bilateral knee (medial fat pad proximal to the joint line). 1. Widespread pain for at least three months (pain in the left side of the body, plus right side of the body, plus pain above the waist, plus pain below the waist, plus axial pain; axial pain includes pain in the cervical spine, or thoracic pain, or low back, or anterior chest wall). 2. Presence of 11 TP among 18 specified sites as has been described above. The presence of a second condition does not exclude a diagnosis of FMS . The emphatic statement with regard to “lab testing” is that no particular test is necessary to rule in or rule out fibromyalgia, which essentially should be diagnosed by its own clinical characteristics as described above. No special laboratory or radiologic testing is necessary for making a diagnosis of FMS; routine testing for rheumatoid factor or antinuclear antibodies is not recommended. Blood and/or radiologic tests for concomitant conditions, if clinically indicated by history and/or examination. 42 U.S.C. § 423(d)4 defines “disability as “inability to engage in any substantial gainful activity by reason of any medically determinable physical or mental impairment which can be expected to result in death or which has lasted or can be expected to last for a continuous period of not less than 12 months… For purposes of this subsection, a “physical or mental impairment” is an impairment that results from anatomical, physiological, or psychological abnormalities which are demonstrable by medically acceptable clinical and laboratory diagnostic techniques. Medically acceptable. This term means that the clinical and laboratory diagnostic techniques that the medical source uses are in accordance with the medical standards that are generally accepted within the medical community as the appropriate techniques to establish the existence and severity of an impairment. The medical standards that are generally accepted within the medical community as the appropriate techniques for establishing the existence and severity of fibromyalgia and chronic fatigue syndrome are detailed in various medical publications. See, for example, Wolfe, F. et. al. : The American College Of Rheumatology 1990 Criteria For The Classification Of Fibromyalgia: Report Of The Multicenter Criteria Committee. Arthritis & Rheumatology (1990) 33:160-72. See also the December 1994 revised working case definition of CFS established by the Centers for Disease Control: Fukuda, et.al. “The Chronic Fatigue Syndrome: A Comprehensive Approach to its Definition and Study,” Annals of Internal Medicine, (1994) 121:953-59. In a claim involving allegations of disability based in whole or in part on FM or CFS, it is the responsibility of the claimant’s representative to ensure that the claimant’s treating and/or examining physicians are aware of, and employ, the techniques for establishing the existence and severity of fibromyalgia and chronic fatigue syndrome as set out in the above-referenced medical articles and SSR 99-2p. The Ninth circuit is the highest federal Court in the western states and its holdings control federal court decisions in Arizona. In Day v. Weinberger, 522 F.2d 1154 (9th Cir. 1975), the Ninth Circuit addressed the fact that disability may be proved by medically-acceptable clinical techniques. , “in concluding that Day was not disabled, as “disability” is defined in 42 U.S.C. § 423(d), the Hearing Examiner relied on three other factors. First, he noted that none of Day’s medical experts had been able, through the use of objective diagnostic techniques, to identify specific cause for Day’s alleged pain. Second, the examiner noted that during Day’s appearance at the hearing, she did not exhibit the physical manifestations of prolonged pain that are listed in a leading medical textbook. Finally, the examiner relied on his own observations of Day at the hearing and certain of Day’s own testimony in concluding that she remained capable of doing light work. For three cases within the Ninth Circuit addressing FM and CFS see Reddick v. Chater, 157 F.3d 715 (9th Cir. 1998); Bunnell v. Sullivan, 947 F.2d 341 (9th Cir. 1991); and Irwin v. Shalala, 840 F.Supp. 751 (D.Or. 1993). “Your letter states that fibromyalgia and CFS do not constitute medically determinable impairments within the meaning of section 223(d)(3) of the Social Security Act because there are no acceptable medical criteria by which these impairments can be diagnosed…. However, SSA has taken a definitive position that fibromyalgia and CFS can constitute medically determinable impairments within the meaning of the statute. As you noted in your letter, CFS was discussed in the process unification training in 1996-1997…This position is consistent with the instructions in Program Operations Manual System (POMS) DI 24515.075, Disability Digest No. 93-5, and Social Security Rulings (SSRs) 96-3p, 96-4p, and 96-7p, issued on July 2, 1996, which detail our policies as to how symptoms affect determinations of the presence of a medically determinable impairment, impairment severity, and the ability to engage in sustained work activity.